Helpdesk, for any enquiry between 11am- 3pm on working days. 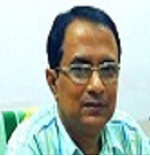 On 9th February, 2000 the foundation stone of College building was laid by Sri Joti Basu, Chief Minister of W.B. in the presence of twenty thousand people approximately. Sri Somnath Chatterjee, Professor Malini Bhattacharya, Sri Ashok Mitra, Smt. Krishna Basu, Mayor Sri Prashanta Chatterjee, Higher education Minister Professor Satyasadhan Chakraborty and many eminent personalities were present there. Within two years and four months the College building was fully constructed. Total useable area was fifty four hundred square feet (this area has been extended later). On the auspicious occasion of inauguration of College building a colourful rally was organized on 16th February, 2003 at Sarsuna. Near about fifteen thousand people participated in it for the sake of expansion of education. On 22nd February, 2003 College building was officially inaugurated by Sri Jyoti Basu, Chief Minister of W.B. 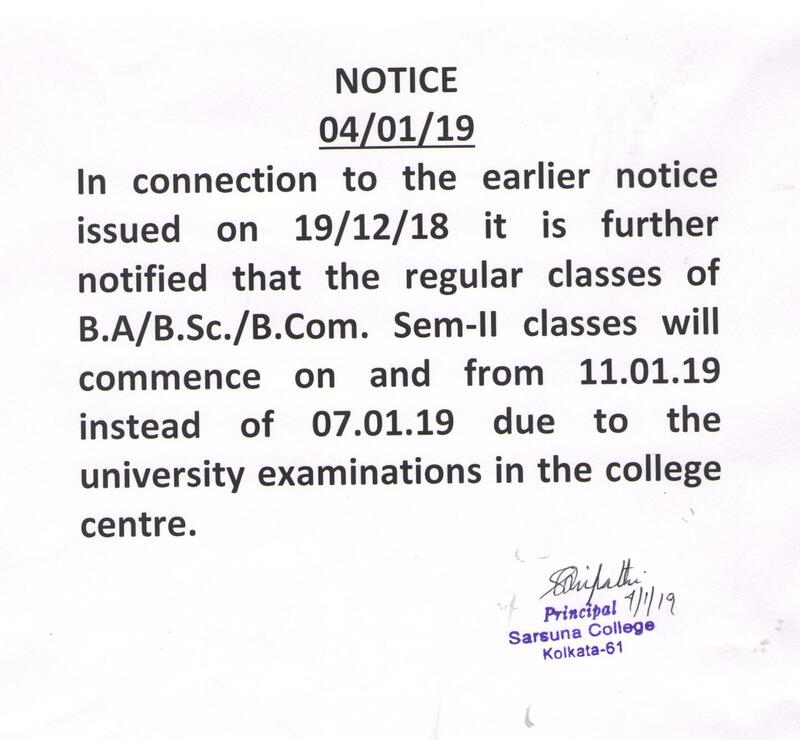 Notice for the regular clasesof B.A./B.Sc./B.Com. 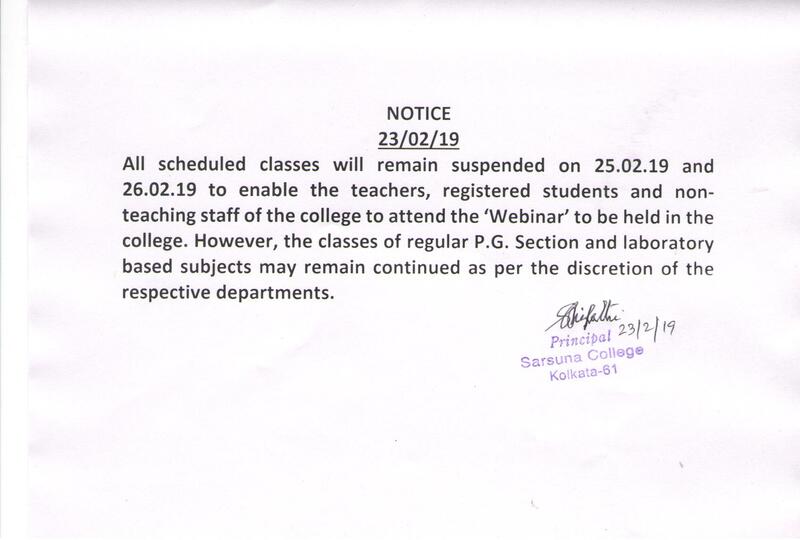 This is for general information to all that the college will remain closed on 04.03.19 on account of Sivaratri instead of 05. 03. 19. All scheduled classes will remain continued on 05. 03. 19 as usual. 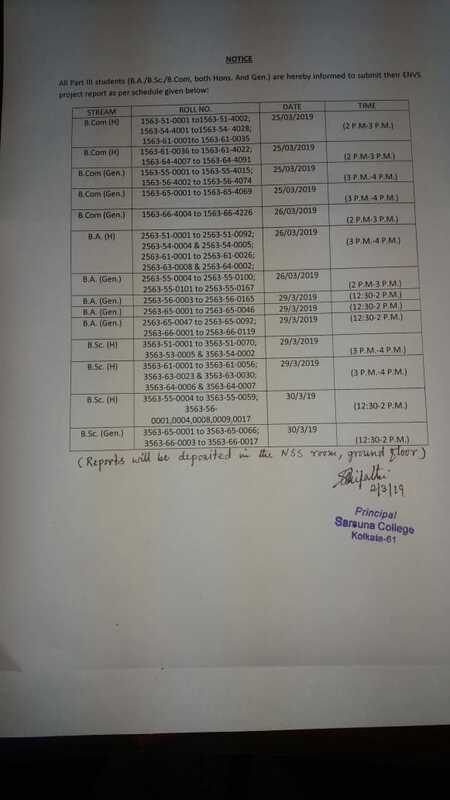 All scheduled classes of B.A./B.Sc. 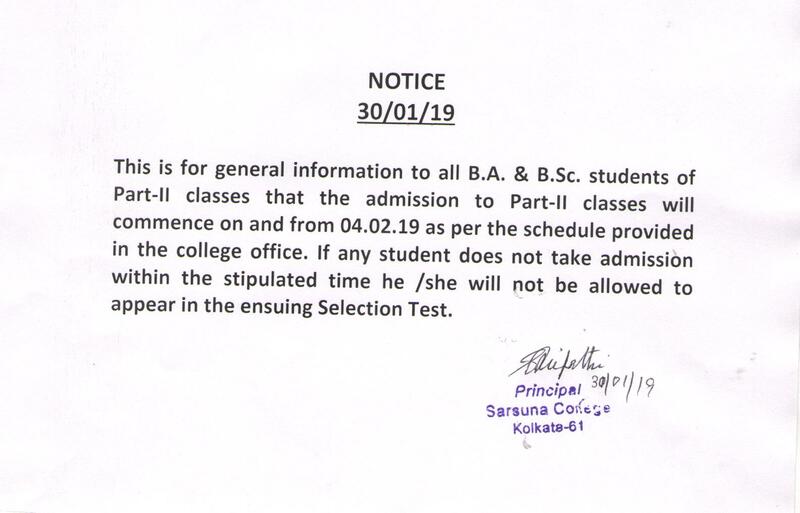 Sem-II and Part-III and B.Com Sem-II/Sem-IV will remain suspended on 21.02.19 and 22.02.19 due to the Selection Test of B.A/B.Sc. Part-II classes. 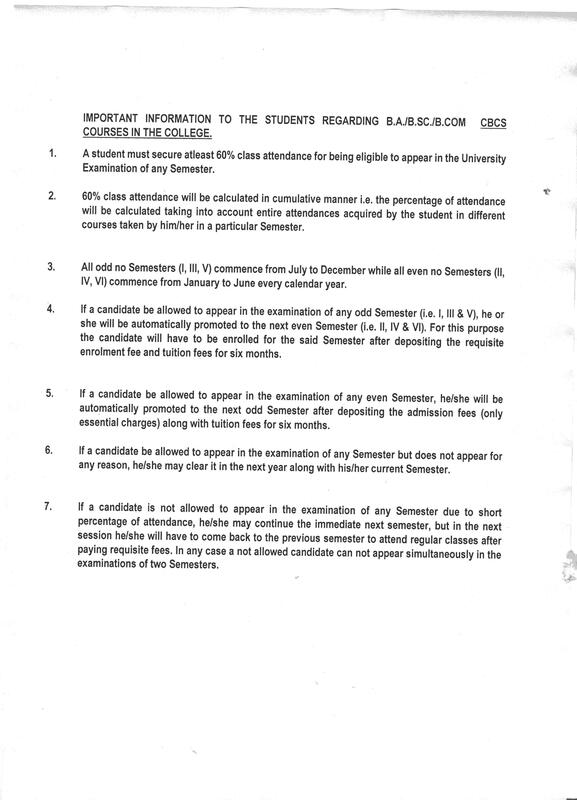 A list of the name of some students of B.A./B.Sc. 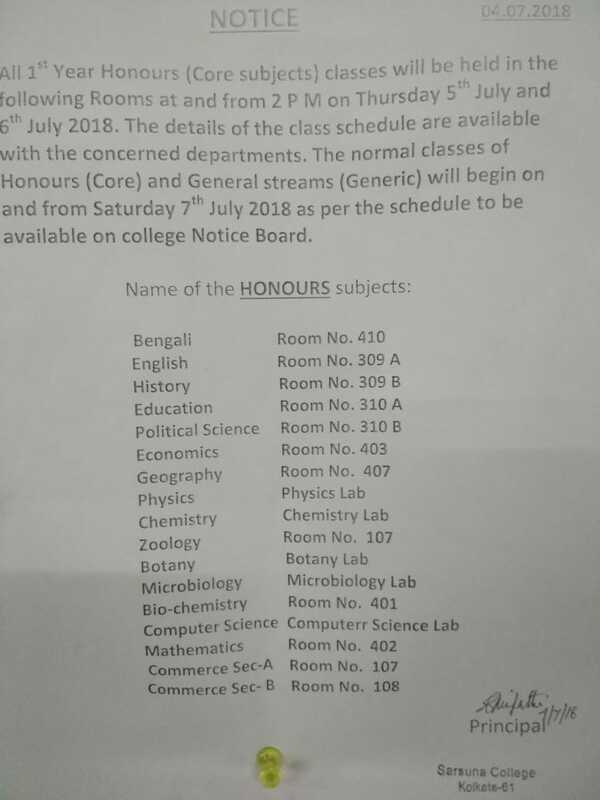 Part-II classes who have transferred from Hons. 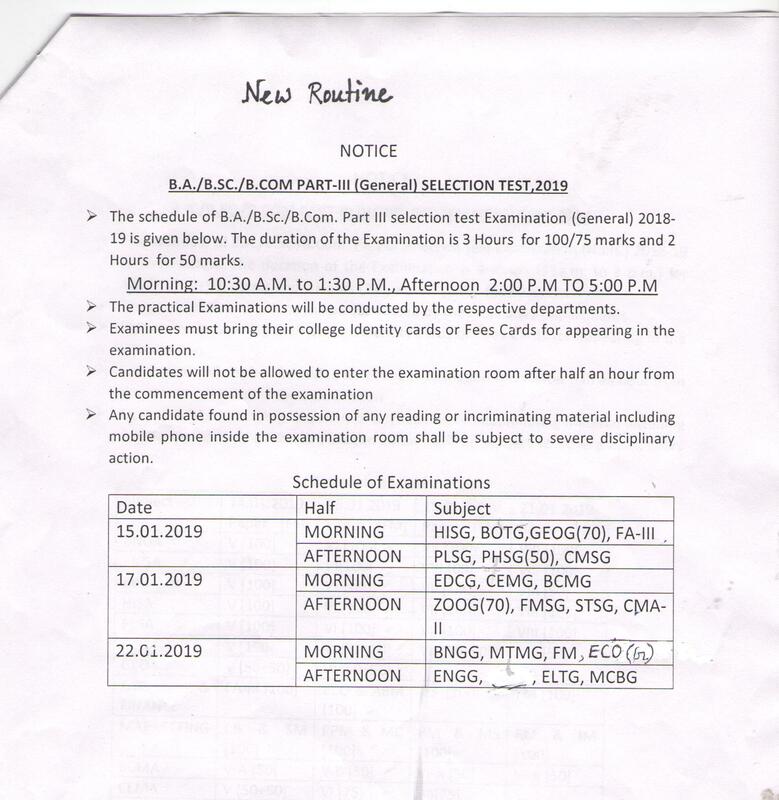 course to General course is displayed in the college notice board. 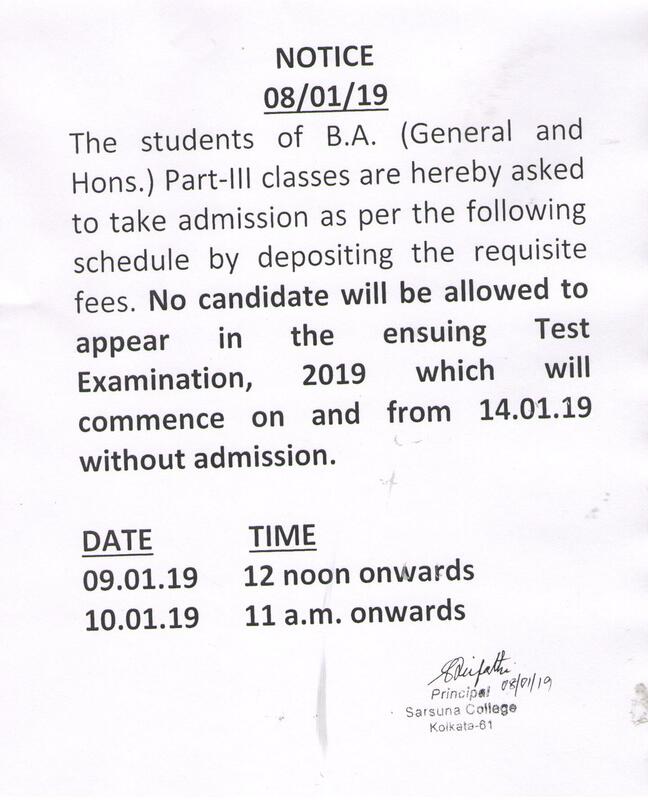 Students are asked to take admission on 21.02.19. Names of the rest students will be displayed soon. 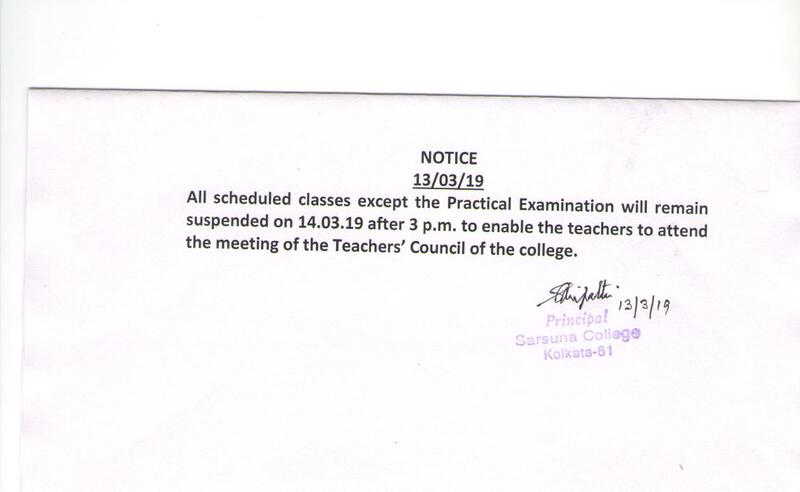 The Annual Sports of the college will be held on 11.01.19 at 10.30 a.m . All teachers, non teaching staff and students are requested to attend the same. 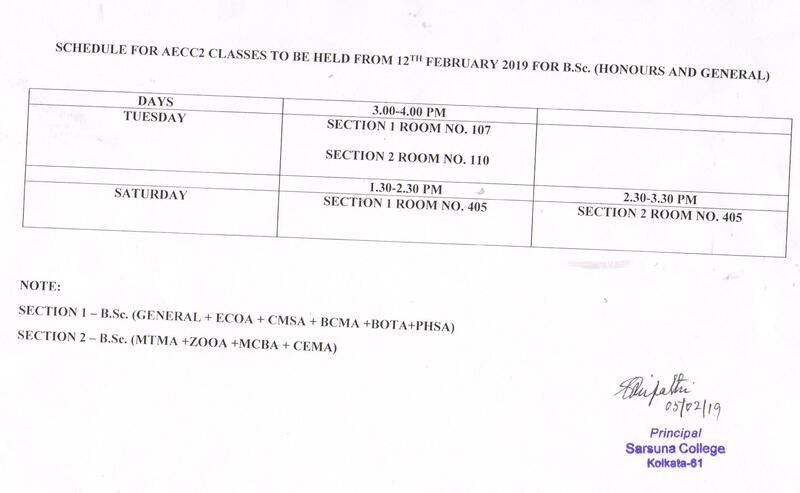 However , no regular classes will be taken on that day except some special classes as per discretions of the respective HODs. THE STUDENTS OF B.A./B.Sc. 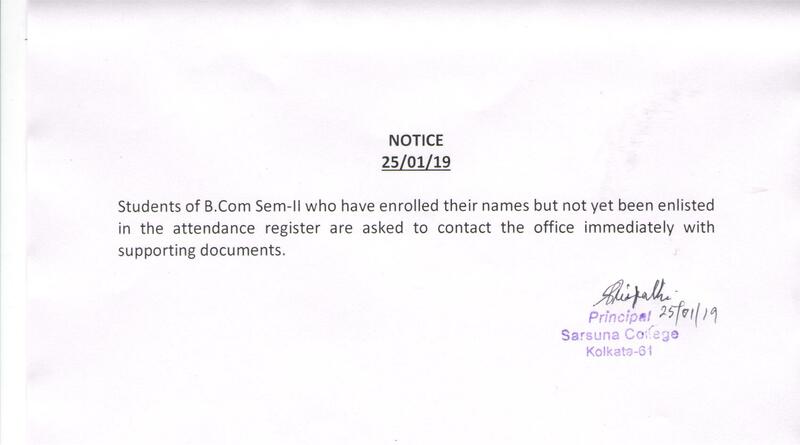 SEM-I CLASSES WHO HAVE NOT APPEARED IN THE INTERNAL ASSESSMENT EXAM, 2018 ARE HEREBY ASKED TO BE PRESENT IN THE SEMINAR HALL ON 24/11/18 AT 12 NOON. 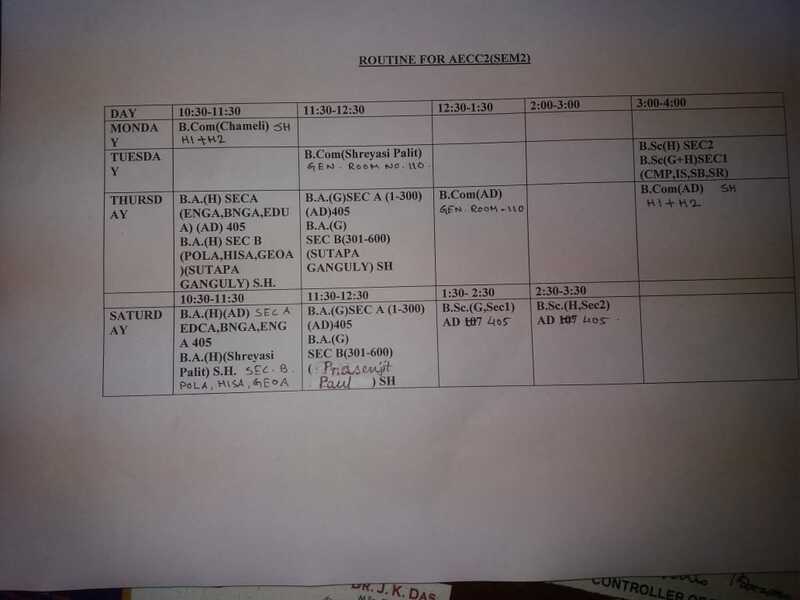 All scheduled classes of B.A./B.Sc./B.Com. 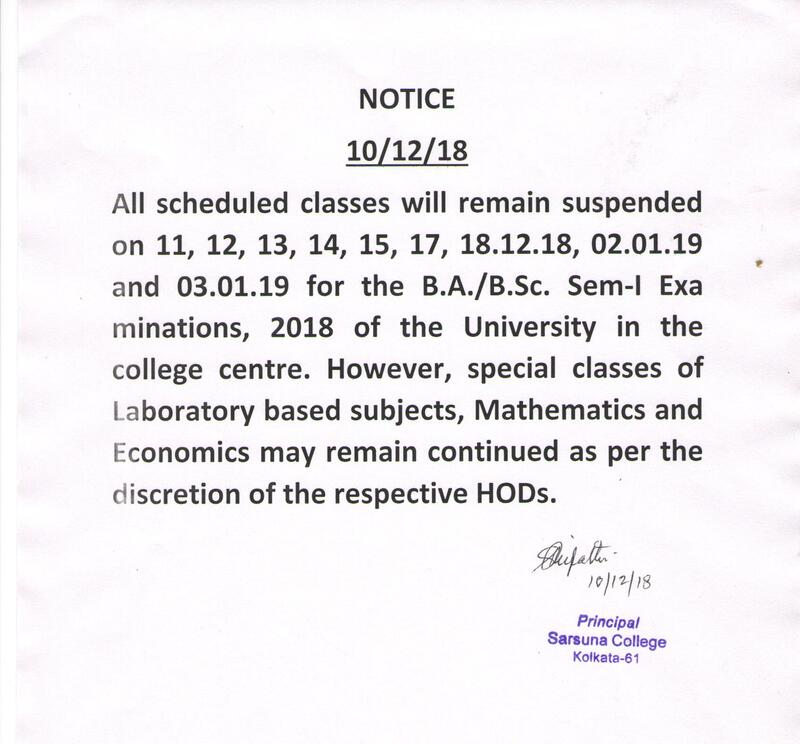 will remain suspended on 19 , 20 and 22.11.18 for the Internal Assessment Exam. of B.A./B.Sc. Sem - I students. 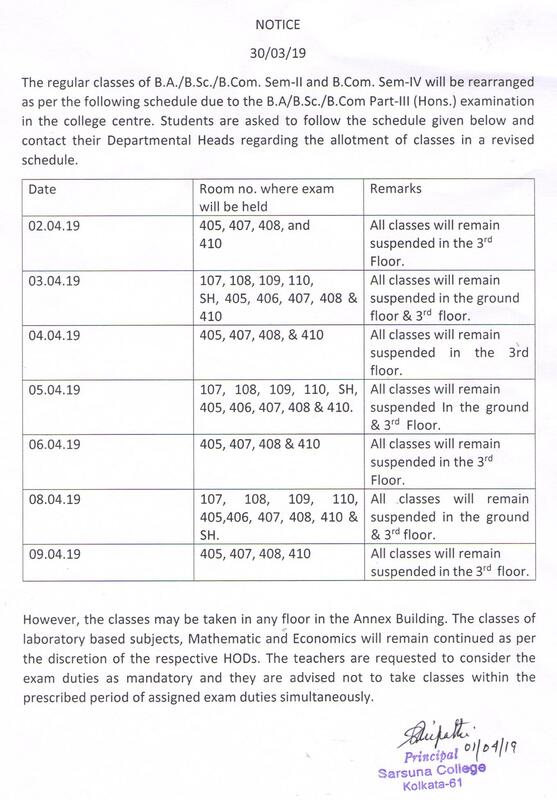 However, special classes will remain continued as per the discretion of the respective HODs. 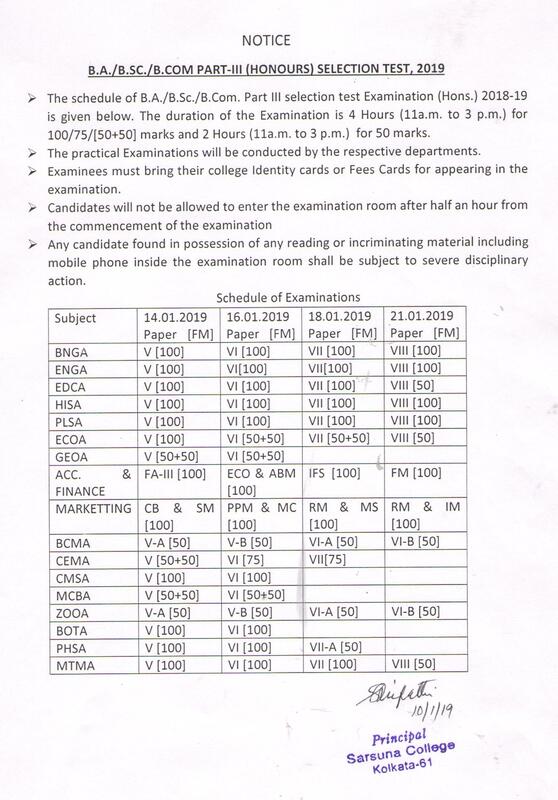 A LIST OF PROBABLE CANDIDATES WITH SUBJECTS COMBINATION FOR B.A/B.SC SEM-I EXAM HAVE ALREADY BEEN WALLED UP IN THE NOTICE BOARD. 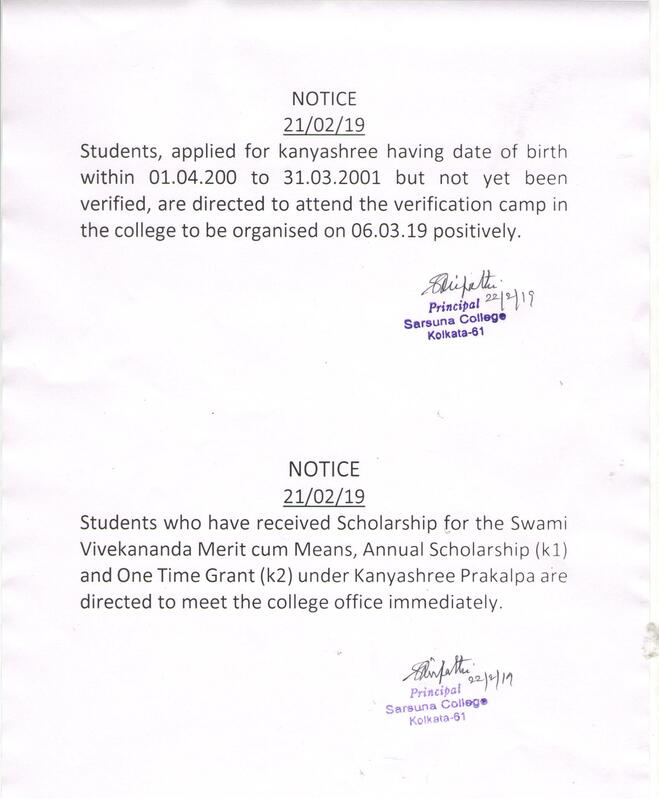 STUDENTS ARE DIRECTED TO CHECK THE LIST PROPERLY AND IF ANY INDISCRIPENCY FOUND THEN IMMIDIATELY CONTACT WITH COLLEGE OFFICE. 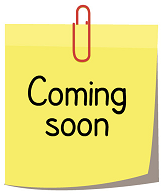 Parents teachers meeting of the department of English will be held on 10th October 2018 at room no 207. Attendance is mandatory. 3rd year honours - 1 pm. 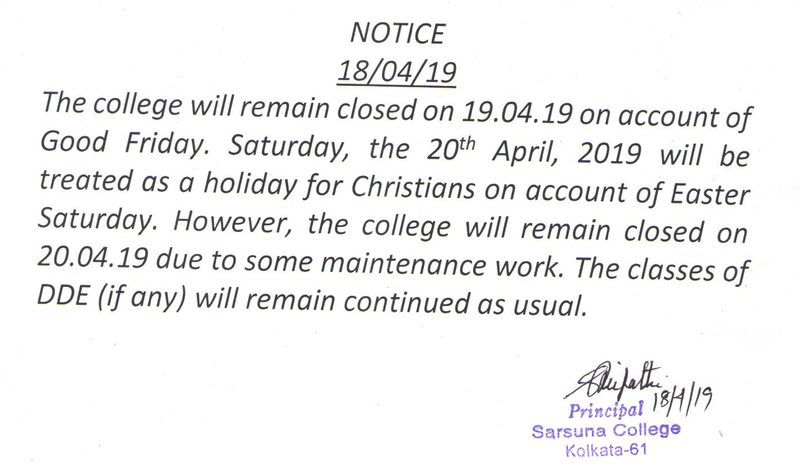 The college will remain closed on 02/10/18 on account of the birthday of Mahatma Gandhi, the father of nation. Students of B.A/B.Sc. 2nd year classes are hereby asked to take provisional admission on and from 24/09/18. They are further informed that without taking admission they will not be allowed in the classes and library. 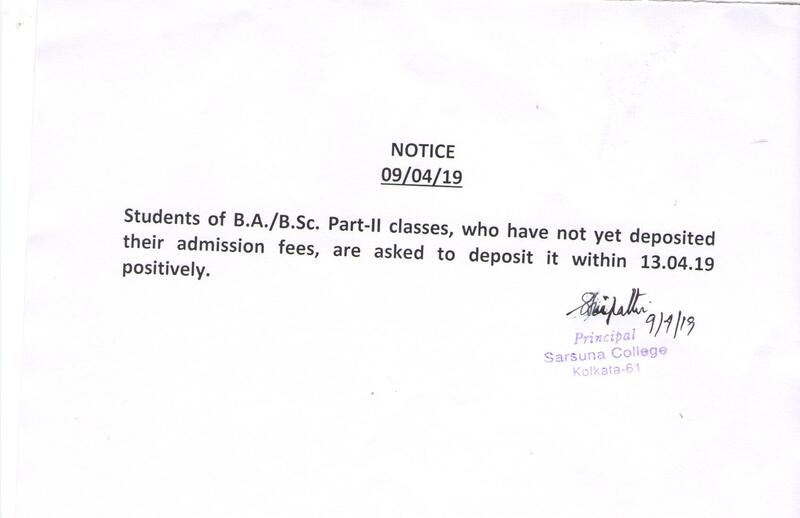 The provisional admission of the students to B.A./B.Sc./B.Com. We are deeply sorry to the demise of late Atal Bihari Bajpayee, the former Prime Minister of the country. 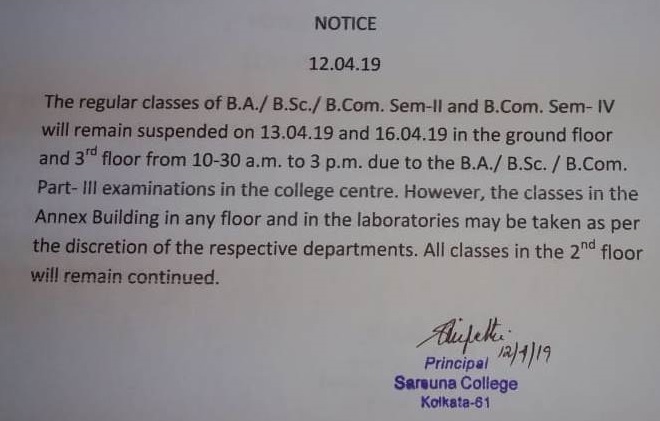 The college will remain closed on 17/08/2018 after 2 P.M to pay homage to his departed soul. 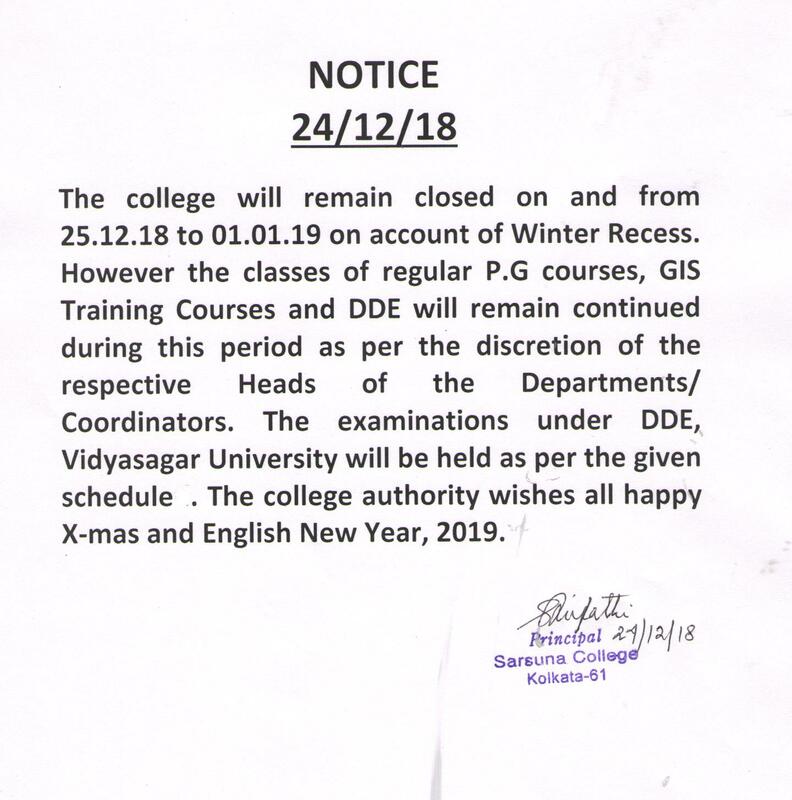 However all University Examinations will remain continued as usual.............. Principal. All classes of B.A. / B.Sc. 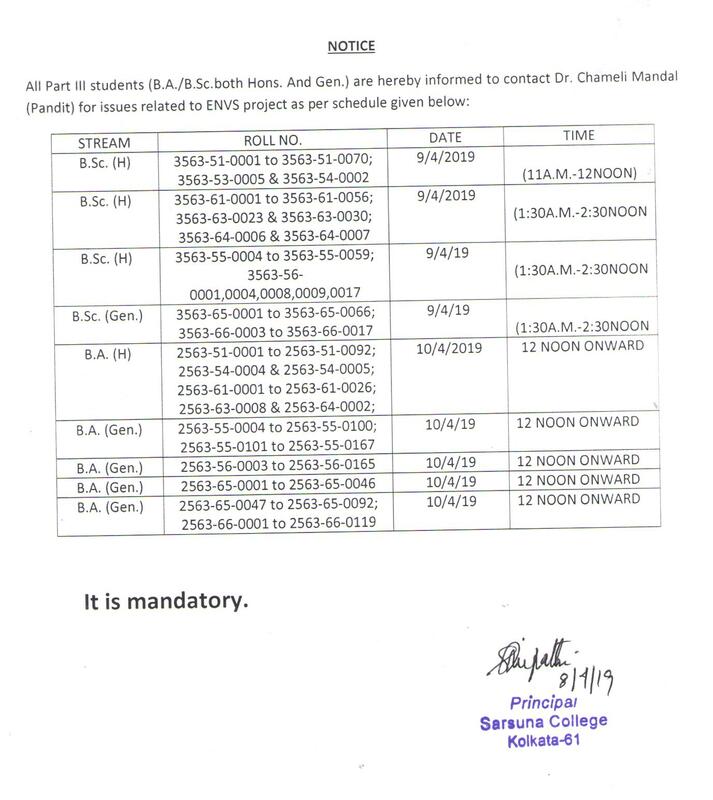 Part-II will commence on and from 13/08/2018 as per the given schedule. 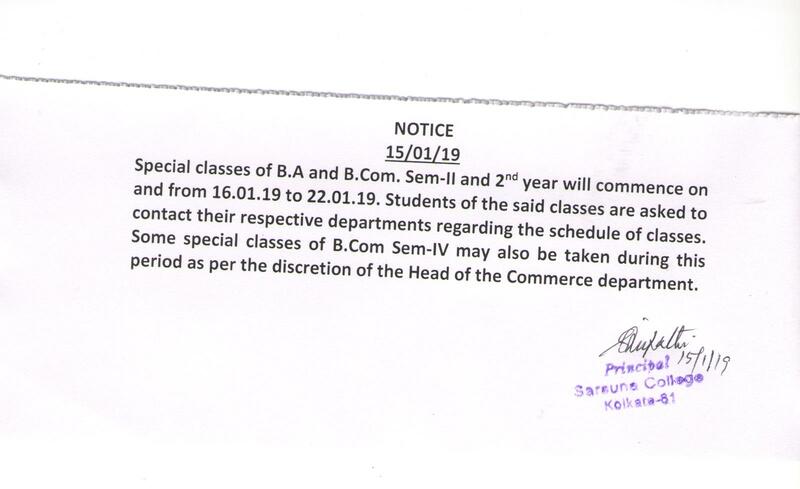 All students of B.Com Sem – I are hereby asked to opt their AECC course to the HOD Commerce in their regular class on 24.07.18. 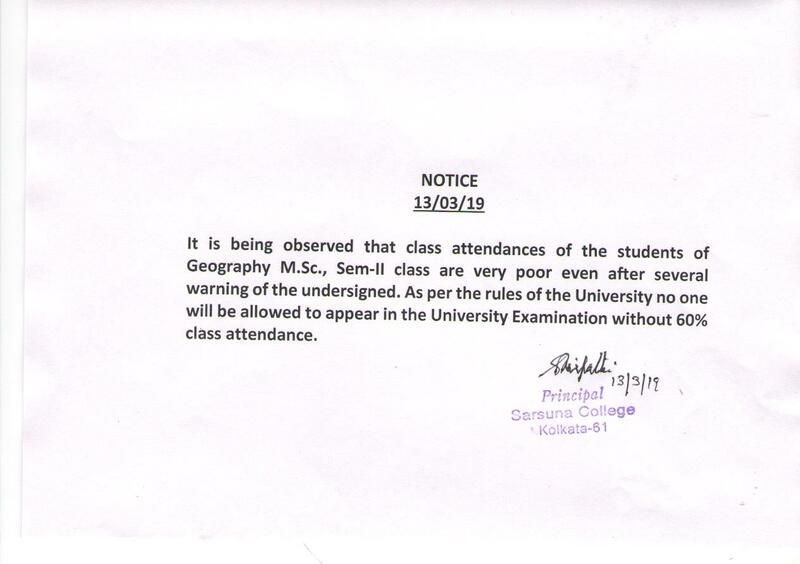 All classes in the room no.405, 406, 407, 408,409A, 409B ,410 and Seminar Hall (SM) will remain suspended on 23.07.18 upto 2 p.m. all other classes will remain continued as usual and as per the discretions of the respective HODs. The classes of B.Com Sem-III will remain suspended on that day. 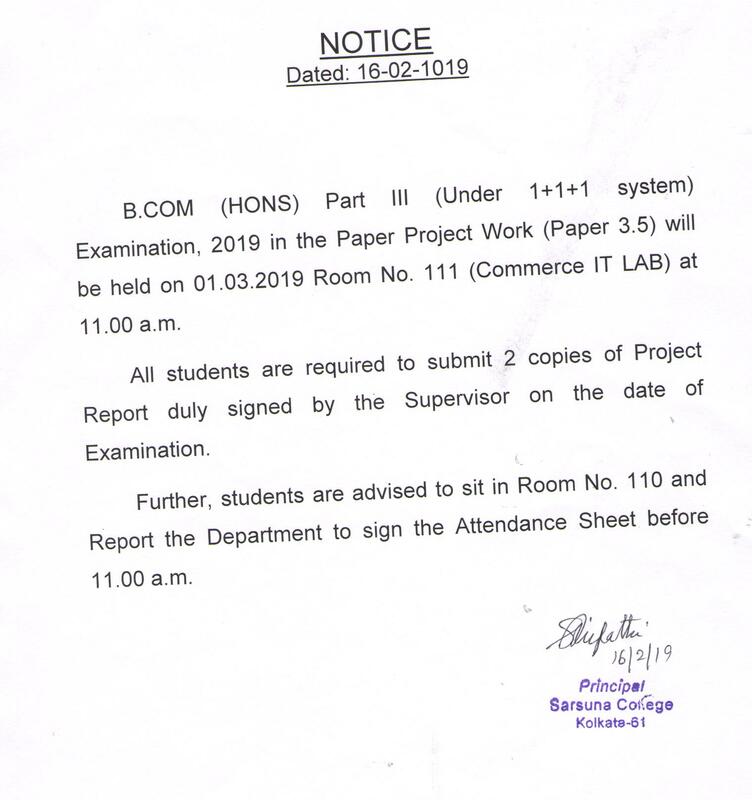 The full routine will be followed on and from 10/07/18 except on the days of CU examination. 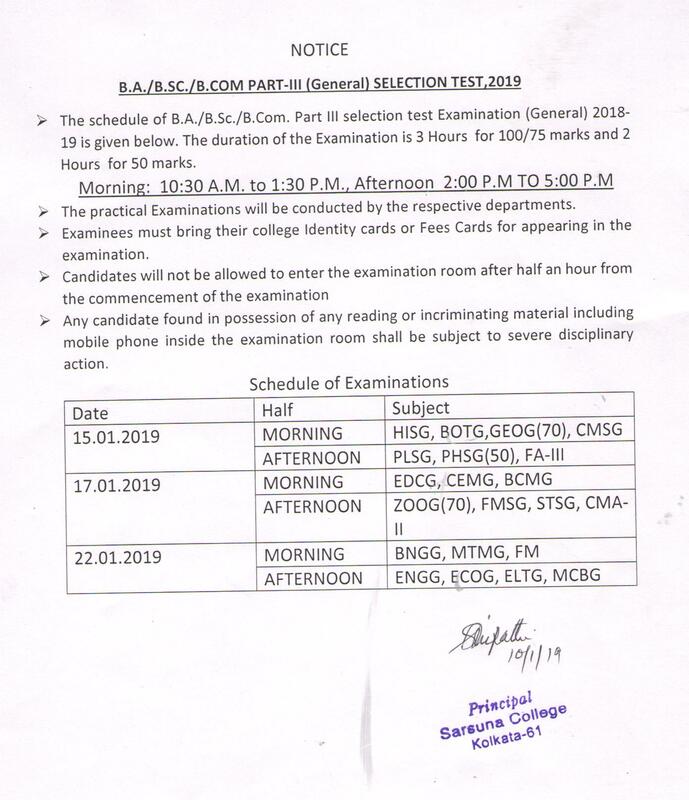 The provisional routine will be followed on the days of CU examination. 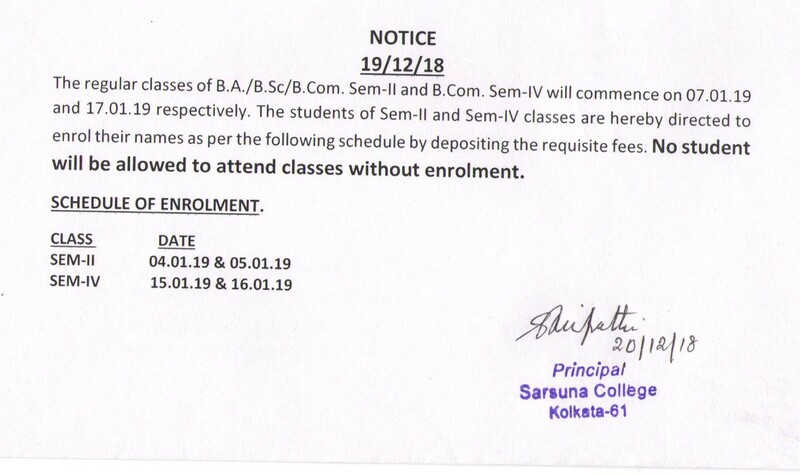 CLASS START NOTICE FOR 1ST YEAR 2018. Last date of submission of Under Graduate Admission 2018-2019 form: 17.06.2018 12:00 Noon. Last date of submission of Under Graduate Admission 2018-2019 form's fees: 17.06.2018 12:00 Noon. The Bengali New Year's Day , 1426. 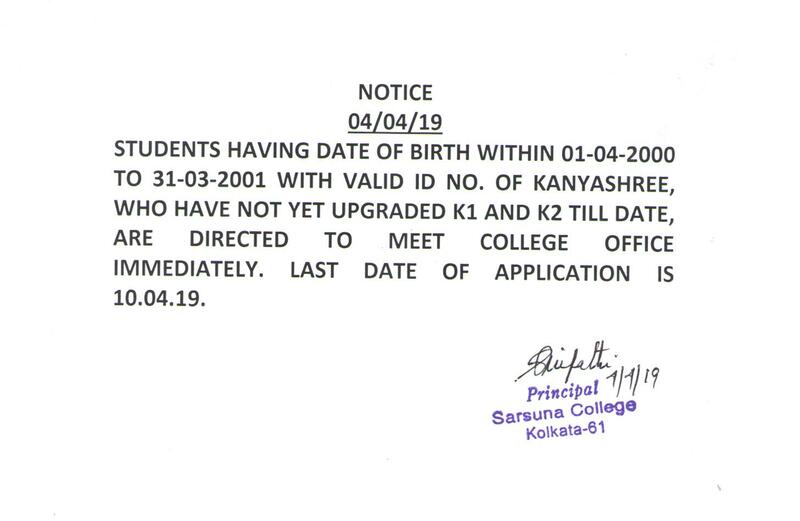 Sarsuna College has been affiliated to the University of Calcutta, Kolkata since 1999. Sarsuna College has been accredited with Grade B from 2015. Sarsuna College is a fully WiFi zone. 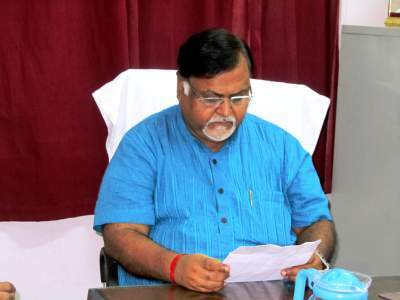 Digitization of central Library and several smart and virtual class rooms encourage. Notice for Counseling and Admission 2018-2019. 3rd Merit List for Under Graduate Admission 2018-2019.